For most of this year, I've woken up in a good mood. Happy. Excited to start my day. but, this is so much better than just waking up in neutral. Several things. Physical, spiritual, and mental things. 1. Physical - living in the Midwest in winter = gray days, roads with snow/ice, coldness. I SO don't like winter. I yearn for warm climates and sunshine. Mostly sunshine. Which led me to a conclusion - maybe I'm lacking in Vitamin D, the sunshine vitamin. Until a few years ago, I drank milk. Now, it's rare. So, I started taking a multi-vitamin for older women. 2. Spiritual - I can't listen to loud (how I like it) music when I work at home or at work. Even when I'm alone, it's too distracting for me mentally. I've started listening to praise music: in the car, at home, at both work sites. I just let it play quietly in the background. This is keeping my focus where it should be: on others and God, not on me. 3. Mental - I decided to be in a good mood. Literally decided. Maybe this decision happened because of the positive effects of the vitamins and praise music. Maybe not. And, some other people think also you can just make being in a good mood a choice you make. Every day. So I have. So, today, I cut my hair ~ this is usual, although sometimes others help or do this for me. 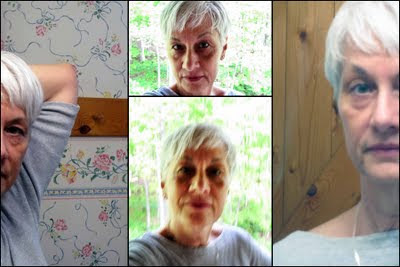 (see this blog post ~ Anne cuts my hair). I had started to look like I could fly because of the wings on the sides of my head. Why do I always wait until I'm desperate? No idea, but I pulled out the hair clippers and scissors this morning. I thought I would post a photo. Ha! Below are the results of my attempts at self-portraiture. There isn't any cropping on the left and right photos.